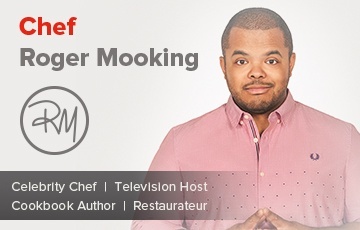 Roger Mooking has earned a reputation as one of North America's premier Chefs by developing a culinary philosophy built on the perfect execution of globally inspired culinary traditions. Coming from a culturally diverse background, the Trinidadian-born, Canadian-raised Chef is no stranger to combining various influences to new and exciting culinary adventures. After Roger's paternal grandfather migrated to Trinidad from Quandong, China he went on to open several bakeries on the small Caribbean Island. This sparked the family's many successful forays into the restaurant and catering business, with Roger's father and extended family eventually overseeing many establishments.